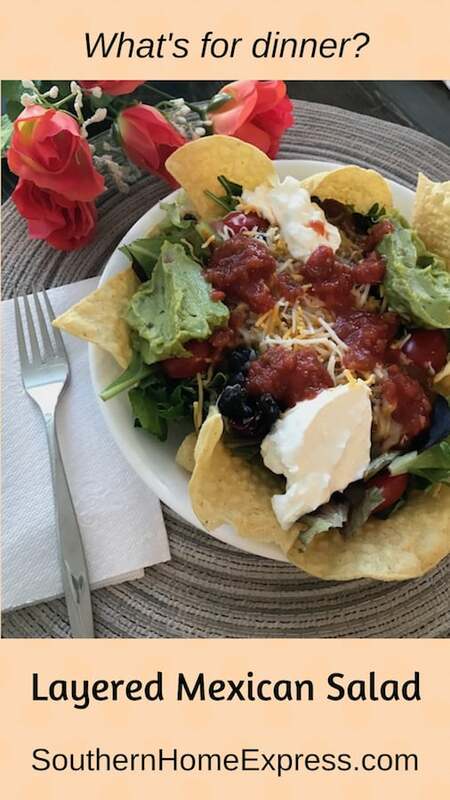 Layered Mexican salad is one of those meals you can make when you crave something spicy but can’t think of anything else to cook. All you need are greens, a few vegetables, and something to give it a Mexican flavor. If you have leftover chili, that’s perfect. If not, canned chili will suffice. 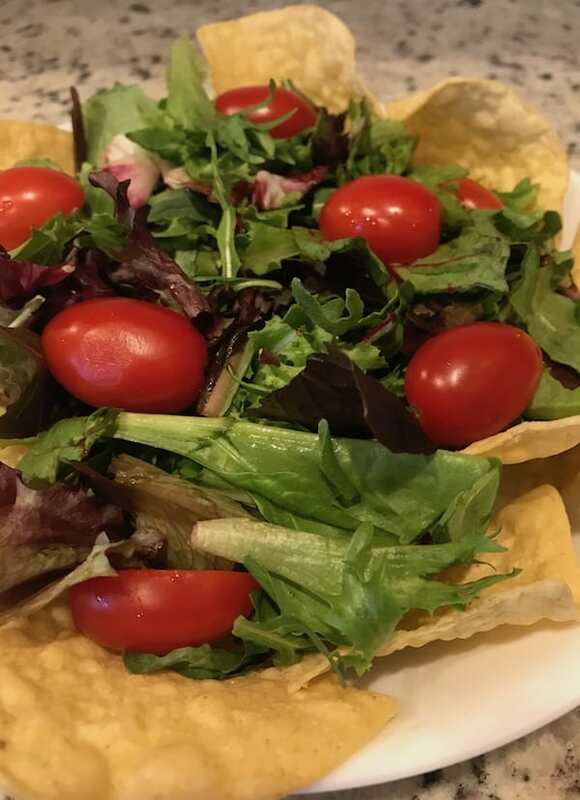 Since I enjoy eating any kind of dinner salad, including a tuna-stuffed avocado, I always have containers of spring mix greens, cherry tomatoes, and cheese. We also typically have some sort of corn chip in the pantry. If you prefer other greens and vegetables, feel free to use them. 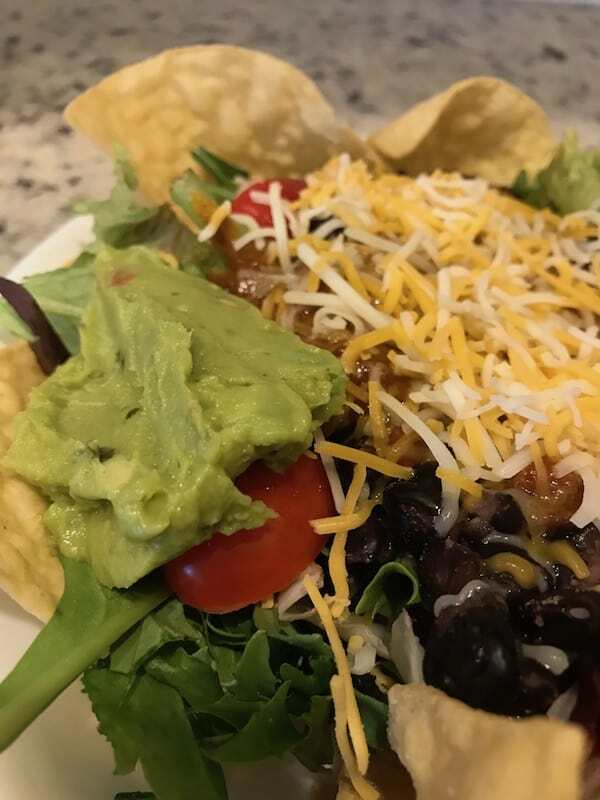 I’ll eat almost anything that’s spicy and full of flavor, so I enjoy a variety of things on my salad. 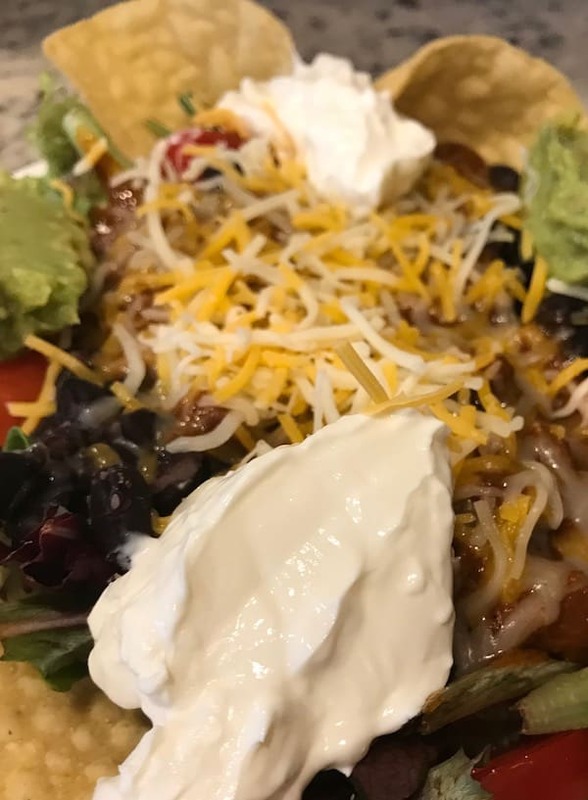 This one has black beans, tomatoes, guacamole, sour cream, and medium salsa. I occasionally use the hot salsa when I’m in the mood. I was planning to cook some homemade chili a few days ago, but I changed my mind. So in this case, I used canned chili because that was all I had time for. Homemade is better, but this is good too. Additionally, you can include corn, jalapenos, bell peppers, onions, cucumbers, olives, radishes, and zucchini. In fact, you can even use rice if you want to tone down the flavor intensity a bit. 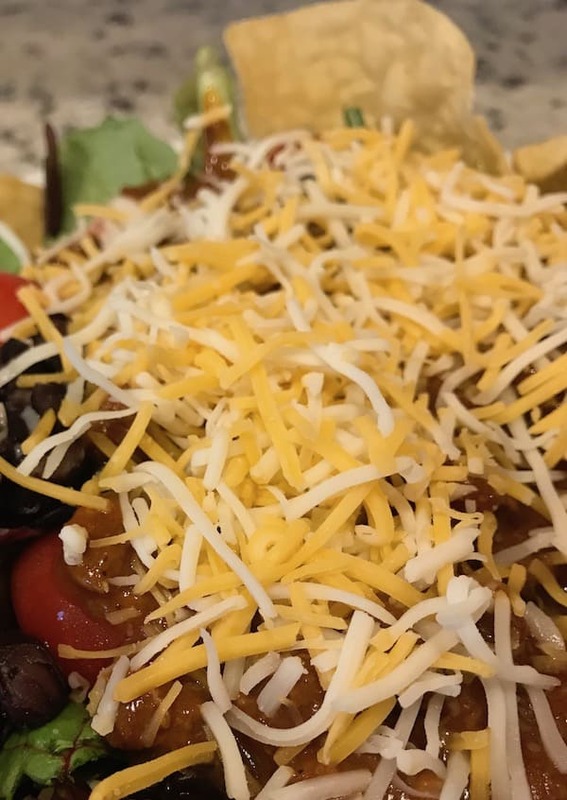 If you want more meat than what you’ll get from the chili, you can add pieces of cooked chicken, shrimp, ground beef, or bite-size bits of steak. Don’t forget that if you add any kind of beans, you’ll get a healthy serving of protein. 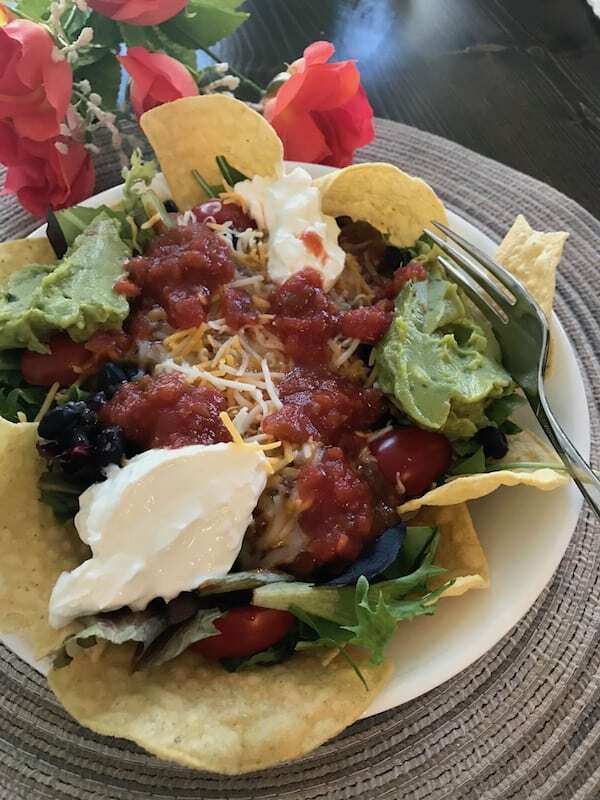 First, line the bottom of a bowl with nacho chips. 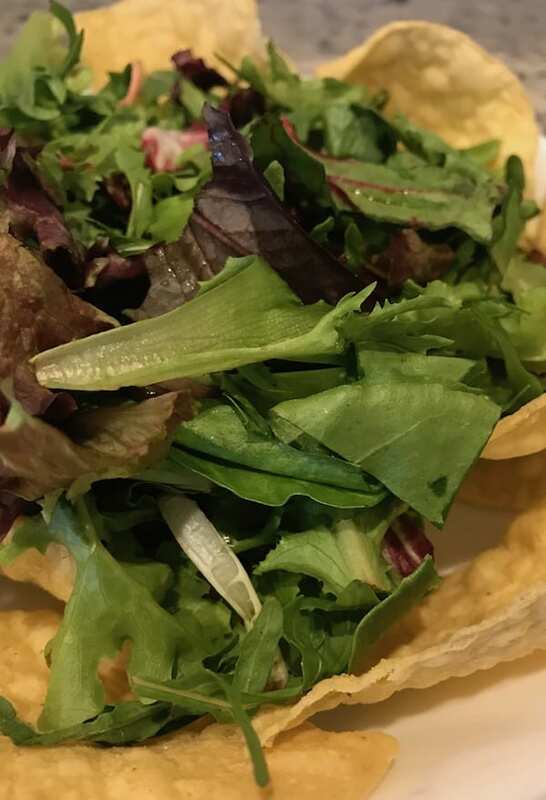 Make sure you have enough to help scoop some of the goodness from the salad. Secondly, add a layer of lettuce. I like to chop it into smaller pieces so you don’t have it flopping all over the place and making a mess. Next, add some cherry tomato halves. You can use as many as you want. 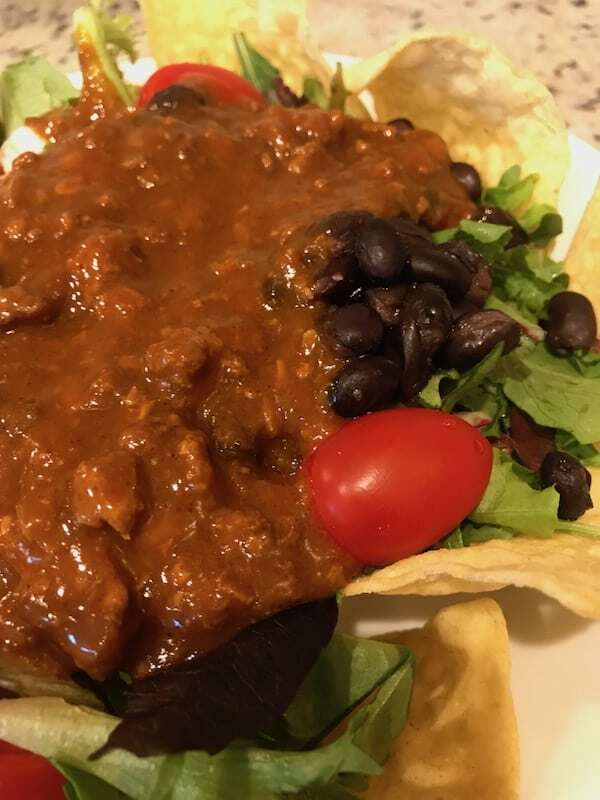 Scoop a layer of black beans over the lettuce and tomatoes. Similarly, add a layer of chili—either with or without beans. I used the one without. Sprinkle shredded cheese over the chili. Next, add a dollop of guacamole to the salad. Also scoop some sour cream onto the salad. You can add anything else you want at any time. Finally, pour a little bit of salsa over the salad. 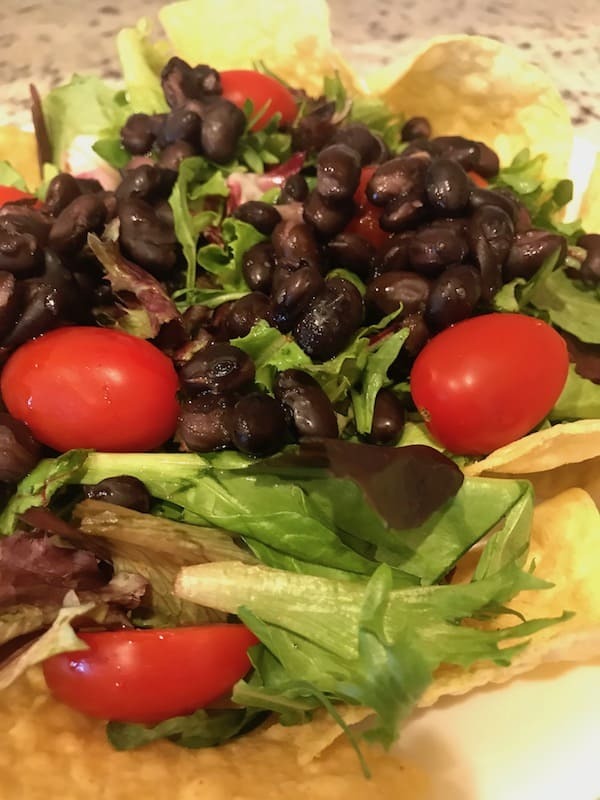 Now your delicious layered Mexican salad with black beans is ready to eat! What Are the 5 Basic Types of Salads? The 5 most common basic salad types are green salads, vegetable salads, fruit salads, bound salads, and a combination of any two or more types. What Are the Most Common Vegetables to Put in Salads? Some of the most common vegetables to put in salads include various types of lettuce, tomatoes, cucumbers, peppers, carrots, onions, celery, artichoke hearts, beets, radishes, mushrooms, and green beans. 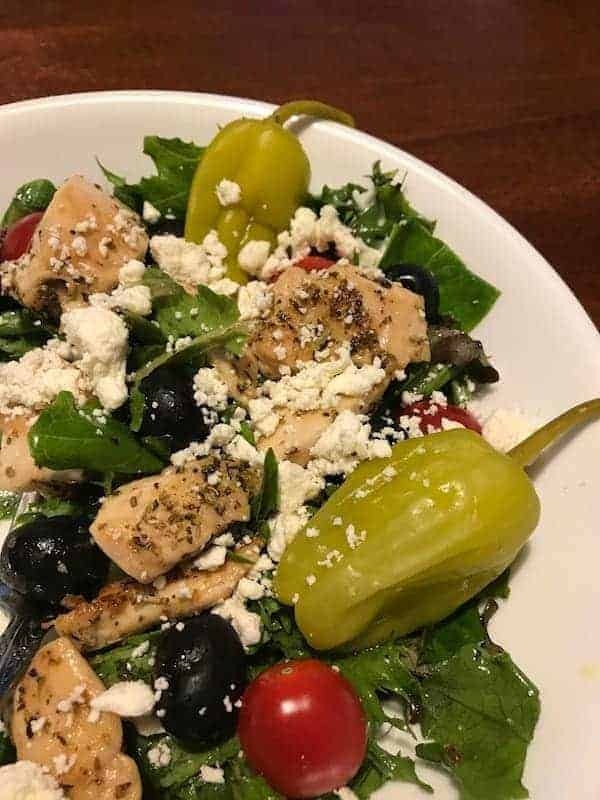 How Can I Make My Salad Better? There are quite a few things you can do to improve your salad. First, make sure you have a variety of colors to make it visually appealing. Secondly, concentrate on adding all of the food groups to get the nutrition you need. Finally, use homemade or semi-homemade salad dressing in order to suit your personal taste. I like a variety of salads, especially when they are packed with flavor. Here’s another one I enjoy. 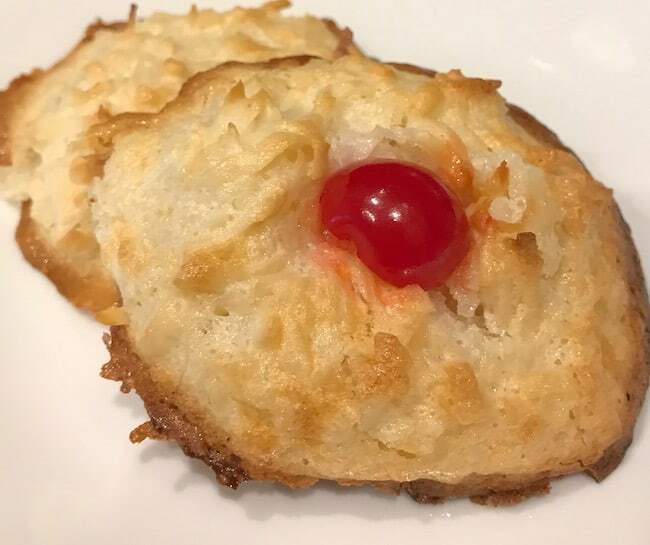 Cookies are the ideal dessert after a dinner salad. You can have a couple or just one to satisfy your sweet tooth. This is a flavorful salad that satisfies anyone who enjoys savory and spicy food. Everything will be added in layers. 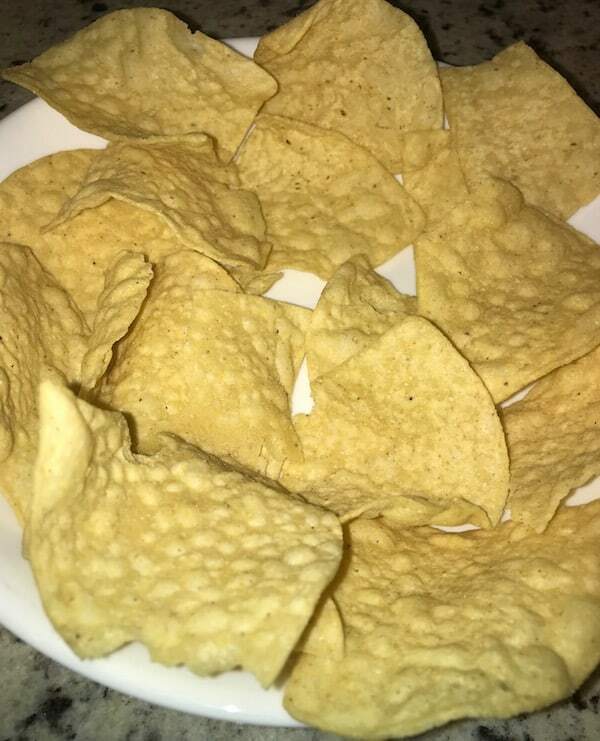 Line 2 bowls with the nacho chips, with 10 in each bowl. Place 2 cups of chopped lettuce over each bowlful of chips. Divide the cherry tomatoes in half and add those to the lettuce. 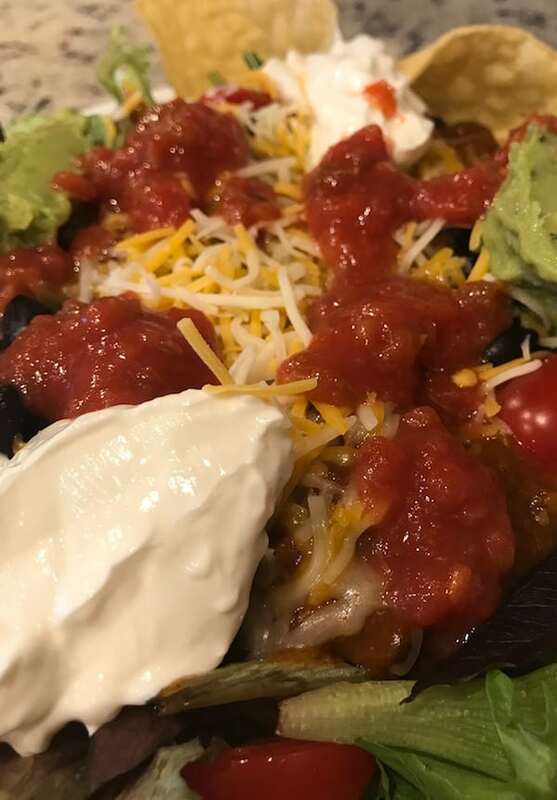 Put half of the black beans over the lettuce and tomatoes in each bowl. Add the chili, dividing it equally between the two bowls. Sprinkle the cheese equally between the two bowls. Divide the guacamole and put dollops into each bowl. Put half of the sour cream into each bowl. 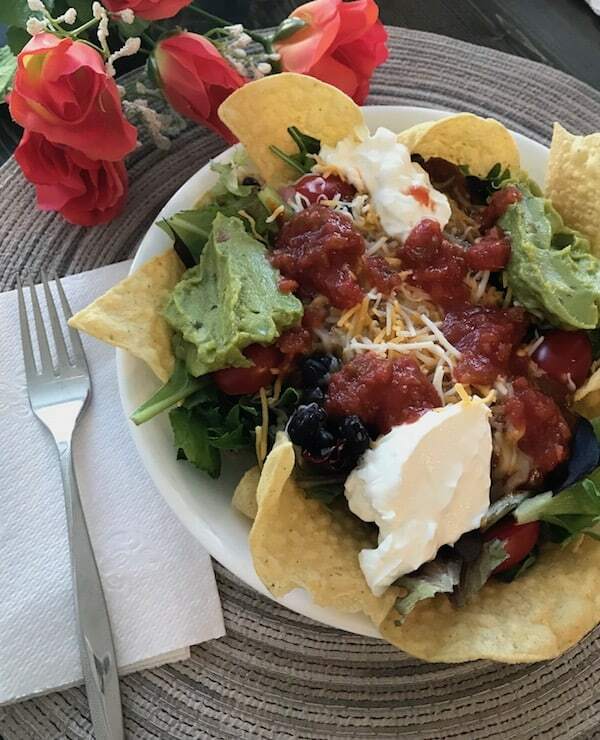 Scoop 2 tablespoons of salsa over each bowl of salad. Thank you, Marilyn! Have a great weekend!